Sugar Mama is one of the more unusually themed slots from Microgaming, the topic revolving around a rich and beautiful lady that is providing for her man. She enjoys her money, her platinum cards, small dog and all the other things that you associate with rich people, and overall it feels like a luxury themed slot, though it has a bit of a focus on the sugar mama aspect as well. You get way more paylines than the average of the industry is, about twice as many actually, as you have 50 of them to activate with your bets. 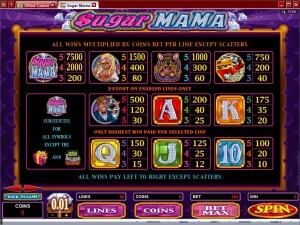 Wilds, bonus games, scatters, free spins and multipliers are all present, so you get a full line-up of features. As for the top prizes, at $15,000 they’re quite decent when you consider just how many chances to win you get each round. With the wild symbol present, you also have two scatters in the game, one triggering a bonus game, the other giving you access to the free spins and to 2x multipliers. 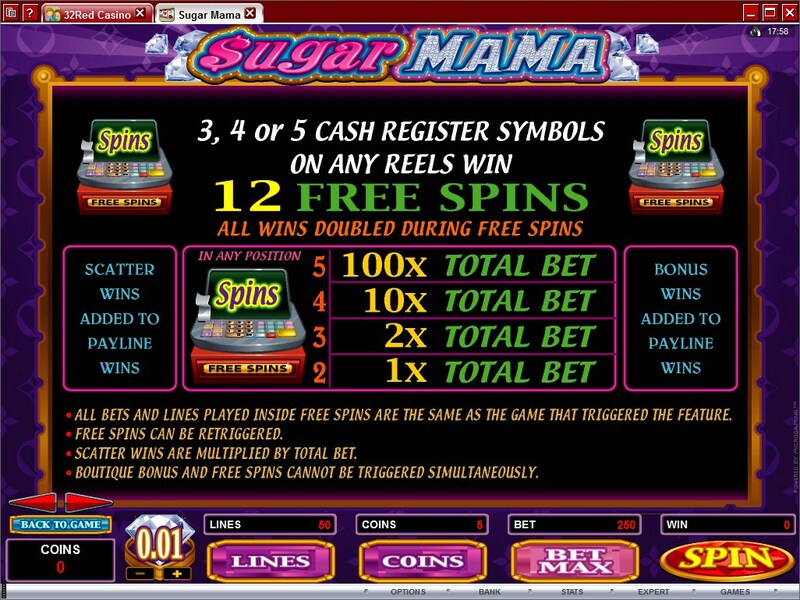 The Sugar Mama Logo is the substitute, the wild symbol as it’s called in most games. The only symbols it can replace are the ones with regular roles, which have to form combinations of three to five symbols and pay you prizes. The wild will do that, but will not help you with the scatter symbols. Wilds also create their own combinations, awarding up to 7,500x in the process, for up to five of them on the same line. I’ve mentioned it before, the fact that there are two symbols with scatter abilities in this game. Both of them require 3 or more symbols to give you their bonus features, but for the cash prizes only two are needed. Get 2 to 5 matching scatter symbols, and your reward will be worth between 1x and 100x the total bet. The bonus game gets started whenever you get three to five bonus symbols on the reels. As scatters, these Gift Box symbols can appear anywhere, as long as enough of them are present. During this bonus game you have to choose three bonus gifts, out of the fifteen that are displayed. Each prize is a multiplier of the total bet, with the biggest value possible here being at 60x the total bet. The second scatter symbols shows you a Cash Register. 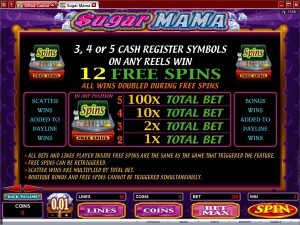 This scatter also has to appear on at least three reels, in order for you to get the free spins that it offers. Your reward will be a round of 12 free spins, with all the wins doubled if they are awarded during this feature. The free spins can also be retriggered. Up to 10 coins per line are accepted in the wagers that you place, with the minimum line bet requiring only one coin. You also activate anywhere between 1 and 50 lines, so the bets can vary considerably depending on your strategy and budget. Since coins only go up to $0.20, the line bets reach $2 and the total bet can get to $100. With the wild symbol forming combinations which award up to 75,000 coins (at 7,500x), the cash value will be $15,000 at most. 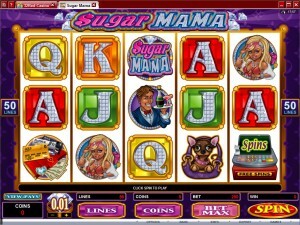 It looks and feels like a luxury themed slot machine, even though it also has the “sugar mama” angle. An attractive lady is the main character here, and you get a glimpse at her lifestyle. A purple abstract image is placed behind the reels, while on them you get the themed symbols and some playing cards which seem to be made out of precious stones. 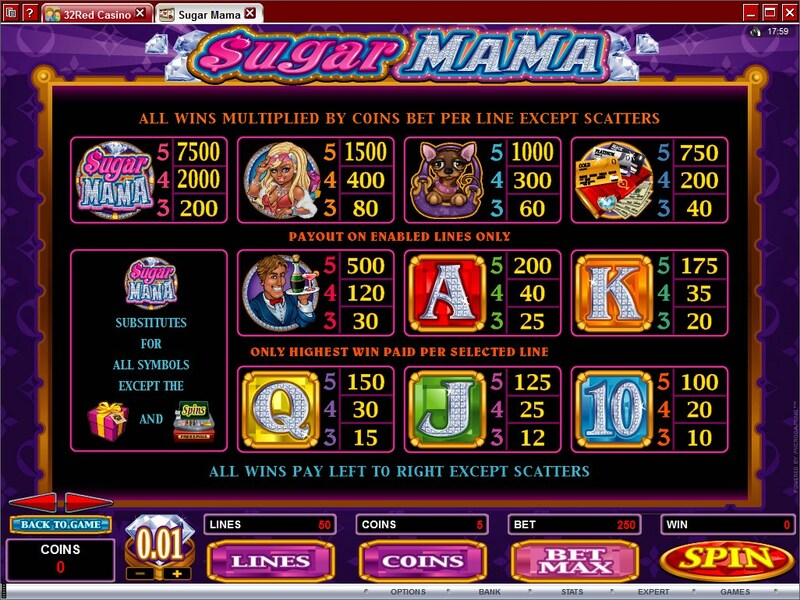 Symbols: Sugar Mama Logo (wild, 7,500x), Cash Register (scatter, 100x total bet), Gift (scatter, 100x total bet), Sugar Mama (1,500x), Small Dog (1,000x), Credit Cards (750x), Young Man (500x), Ace (200x), King (175x), Queen (150x), Jack (125x) and 10 (100x). 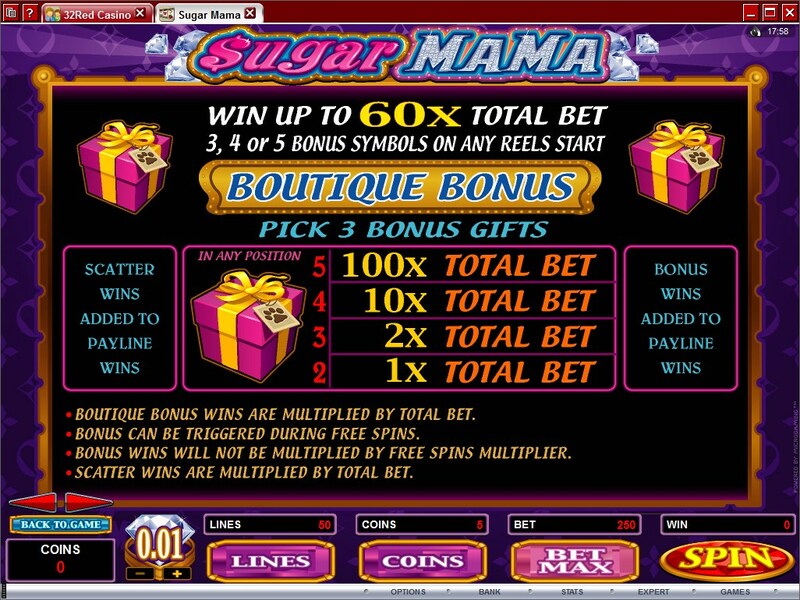 There are plenty of good reasons to play Sugar Mama, including the theme choice and the way the design was implemented, but also the high number of paylines and the features. Overall, a game that I’d recommend. 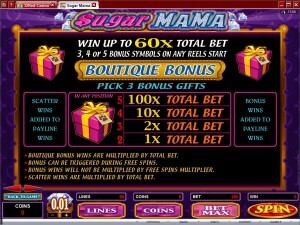 You will find Sugar Mama at any online casino which chooses to use software from Microgaming, playable either for free or for real money.